Goans are known for their roast chilli fry. We usually like to use our beef or pork roasts to make the chilli fry. Leftover roasts do come handy after the festive or celebratory feasts. You need just a few ingredients to dish up a quick chilli fry as the cooked meat is already matured in the spices. The best part is that you can make your adjustments with the chillies, onions and vinegar depending on your personal taste or preference. So here is an easy way of adding a new dimension to your leftover pork roast. You can stuff it in buns, rolls, chapattis, pita bread, Goan poee or just about enjoy it as a starter. 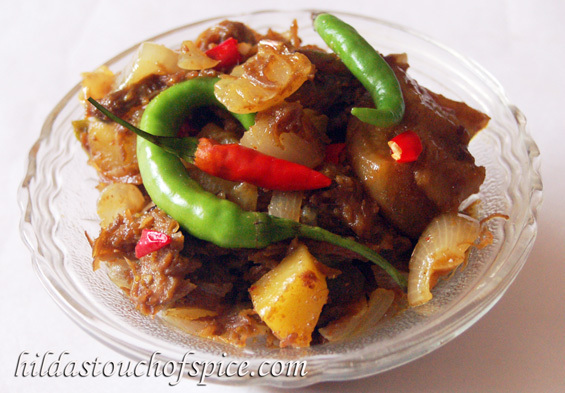 If you are fond of Pork Roast and love onions, potatoes and a whole lot of chillies then just go for this super delicious Goan Pork Roast Chilli Fry in minutes! Enjoy… Cheers!! Heat a wok/kadhai with oil till hot. Reduce heat and add the chillies, garlic-ginger and sauté briefly. Add the drained cubed potatoes, turmeric, salt and fry till the potatoes are cooked through. Next, add the chopped onions and sauté till translucent. Then add the chopped tomatoes or vinegar to taste and a pinch of sugar. Cook till soft. Add sliced/cubed roast pork and give it a good stir. Stir fry on high heat. Add some of the roast gravy if you like your chilli fry to be moist and succulent. Reduce heat and adjust salt to taste. Give it a good stir. Stir fry for a few minutes. Serve hot with bread, pav, poee, pita bread, any Indian bread or on the side with pulao.